Veterans are a strong component in the lifeblood of North Carolina’s economy. More than 769,000 veterans live in North Carolina, representing 9.8 percent of the state’s total population. There are over 87,000 veteran-owned firms in North Carolina, and together they generate over $54.9 billion in receipts. This makes North Carolina the 8th largest veteran-owned business economy in the nation. Unfortunately, veteran entrepreneurship is not strongly enough supported throughout the country. Twenty five percent of veterans would like to start businesses, but only 6 percent actually do. Why is this? The problem is simply lack of a platform. There are an abundance of resources for veterans, but historically, none of these resources have provided support towards new business ventures. After World War II, a whopping 49 percent of veterans returned home to start their own businesses. Because nearly every eligible man had served, everyone knew someone within the network of veterans. Today, only 1 percent of young people enlist in military service, so the network of support is much lower. Given all of this information, Todd Connor, an entrepreneur and Navy veteran decided to create the platform that would allow veteran innovation to thrive. Connor knew that he could send care packages overseas, or write a letter to a soldier over the holidays, but he “wanted to do what I do best for veterans.” Connor decided to offer his strong business knowledge and entrepreneurial skills to other veterans. Thus Bunker Labs was born. 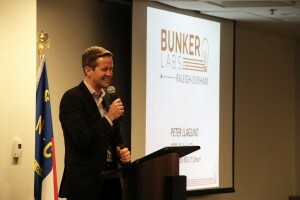 Bunker Labs is a highly networked local community which offers a unique entrepreneurship curriculum as well as highly qualified subject matter experts to develop an environment of entrepreneurial support. Connor says that when it comes down to it “the curriculum doesn’t matter.” Although Bunker Labs does have a wonderful curriculum, it is the people that create the success of the program. Alisha Ramsey is a fellow veteran and cohort at Bunker Labs RDU. As the founder and CEO of Tellurvision Studios, she deeply understands the ways that military training prepare individuals for the business world. Here at the Research Triangle Foundation, we are committed to ensuring that veteran entrepreneurship continues to thrive. That is why we have partnered with Bunker Labs to create a space to equip veterans for success in their entrepreneurial ventures. 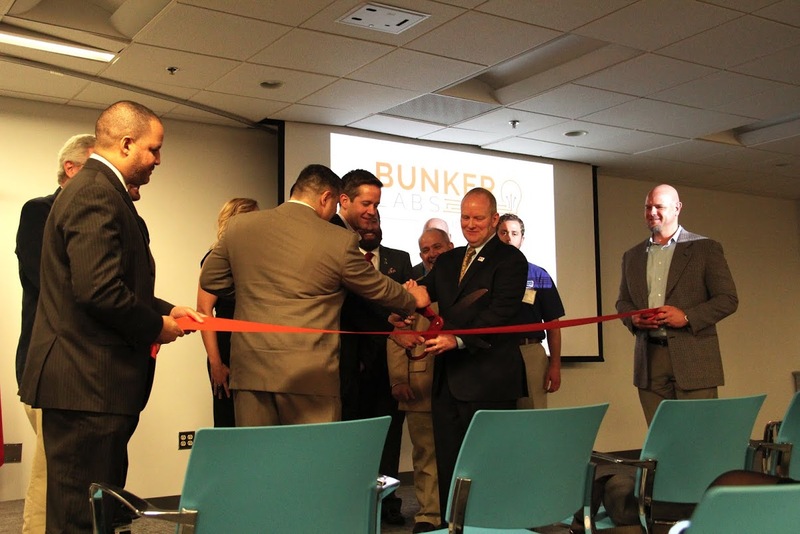 Bunker Labs RDU is now located within The Frontier building in Research Triangle Park. The Frontier, which is a collaboration destination open to anyone in the community, is an ideal location to build vital entrepreneurial networks. The space is an incubator for innovation to thrive. Every day, renegades and pioneers collaborate to promote their businesses and support each other. “When we talk about renegades and pioneers, who better represents that than veterans?” says RTF President and CEO, Bob Geolas. The Foundation is fully supportive and confident that The Frontier will be the perfect place for Bunker Labs RDU to thrive. As I sat amongst a crowd of business people and veterans who had come out to support Bunker Labs RDU, I was overcome by a deep sense of patriotism like nothing I have ever experienced. The overwhelming success of the event truly speaks to the support that the community has to offer this movement, and the veterans it is comprised of. Join us in continuing to follow this amazing new initiative; we know that only the best things are to come for each of the eight entrepreneurs embarking on this journey together.